Situated by the main entrance of the University of Oregon, the Ford Alumni Center serves as the gateway to the university. It is the gathering place and first stop for anyone who visits the campus, and as such, it provides prospective students and their families, returning alumni, visitors, and function and event attendees with their first impression of the school. With its high-profile stature and broad visitor base, the alumni association had a dream of building a new alumni center that welcomes everyone to the university and shows off the school’s culture by integrating high-tech media with artistic design. To do this, they partnered with Second Story, an interactive media and experience firm. “We have a lot of experience creating diverse interactive experiences that marry great storytelling with innovative technology, great design and powerful back-ends with content management systems,” said Brad Johnson, co-founder and creative director of Second Story. An eclectic team of architects, designers, developers, content strategists and producers worked closely with university staff to create the 2,000-square-foot space, which opened June 10. It was transformed into a visually stunning epicenter that reflects the beauty of the outdoors with the generous use of golden-colored Douglas fir, nature-inspired artwork and hanging bubble light fixtures. Juxtaposed with this organic space are large-scale, high-tech media installations that capture the university’s past, present and future. The Ford Alumni Center showcases nine floor-to-ceiling Oregon Cascades, interactive media and memorabilia towers that define the university experience; the Alumni Table, a touch-screen directory with information on every alum in the school’s history; and the Entry Wall, which recognizes individuals who donate to the university by shining their names in lights. “Second Story conceived of each installation in response to active, collaborative interchange with great clients that had vision, well-articulated goals and objectives, and the ability to push us in ways that helped both teams go beyond what where we first imagined,” Johnson said. Each of the nine 16-feet cascades cycles through five themes: LEARN (Academics), COMPETE (Athletics), LIVE (Student Life), EXPLORE (Campus and Community) and HONOR (Notable Ducks). Six cascades are interactive and touch sensitive and offer the themes on demand. These Cascades are essentially four 46-inch LCD monitors that are stacked on top of each other. Designed to capture the rhythm of water, the content flows down the Cascades like a waterfall, telling the university’s story through videos, images, slideshows, text and infographics. The user experience is similar to clicking and scrolling through content on an iPhone or iPad. Three cascades hold artifacts and memorabilia from the university’s history and celebrate alumni achievements. Some artifacts include an original letterman sweater from the 1950s; a replica of “One Flew Over the Cuckoo’s Nest”, because author Ken Kesey was a university professor; and transistors, as Walter Brattain, the inventor of transistors, received his master’s degree at the university. The content is managed by a powerful, custom content management system that offers flexibility. Administrators can log into the system through the intranet and modify content as needed. They have various templates to choose from and can upload and crop images, add videos, create slideshows and add whole sections to the themes. The interactive Alumni Table holds the university’s heritage. Every graduate in the school’s history—all 240,000 of them—can be retrieved using the directory. The table measures the same length of the Cascades but is positioned horizontally, and it is constructed from the same Douglas fir that is featured warmly throughout the building. 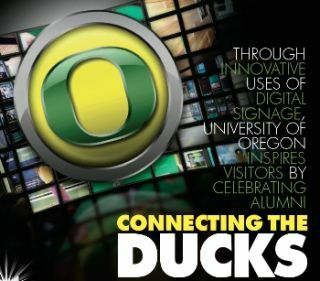 When a visitor touches the UO icon on one of the four 46-inch multi-touch-cell LCDs that make up the table, an interface can search for every Duck by school, class, name or activity. The search results provide each alumnus’ name, school, major, class and activities, as well as a favorite quote or message. The “floating” Entry Wall stands 14.5 feet wide by 7.5 feet high. Eighteen 50-inch LED signage displays are seamlessly embedded in a scattered arrangement within the honey-color Douglas fir slats and cycle the names of all alumni who donate money to the university every year in a warm glow. On the surface of some of the slats, the names of individuals and organizations, whose major contributions made the Ford Alumni Center a reality, are permanently laser etched. Two 46-inch LCDs on the Entry Wall broadcast the day’s campus events. The data is automatically fed from the university’s event database, but an override mode allows the staff to display custom messages for special events. An interactive display informs visitors about the building’s current energy consumption and efficiency as well as building-specific events information (although this portion was not designed by Second Story). The media Cascades require huge amounts of relevant and interesting content. And as Johnson recalls, gathering content was a huge challenge—especially when so many different departments and stakeholders were involved. But with the help of a producer, a content strategist and a point person at the university, gigabytes of content was identified, created, gathered and ultimately transformed into the media that exists at the Ford Alumni Center today. An ongoing challenge has been the amount of sunlight that shines on the interactive touch tables. The sun-drenched atrium overpowers the multi-touch table at certain times of the day. Although Second Story staff went to great lengths to calibrate the sensitivity and modify the interface to account for cruder inputs resulting from solar-powered sensor confusion, the problem endures. They are now looking at sunlight mitigation strategies. According to Johnson, this is an unfortunate but common challenge where clients crave both electronic displays and lots of ambient light. While most university alumni centers don’t receive this kind of treatment, the University of Oregon is dedicated to attracting prospective students and encouraging fund raising by celebrating the alumni. "The vision of the Ford Alumni Center was to provide a central gathering point of connection for our alumni, our university community and the community at-large. The facility is doing that and much more," said Tim Clevenger, executive director of the alumni association.